CORPUS CHRISTI, TEXAS (April 21, 2016) - Ryan Cordell slugged his second grand slam of the season and Connor Sadzeck took a no-hitter into the sixth inning, as the Frisco RoughRiders, the Double-A affiliate of the Texas Rangers, knocked off the Corpus Christi Hooks, 5-2, Thursday night at Whataburger Field. 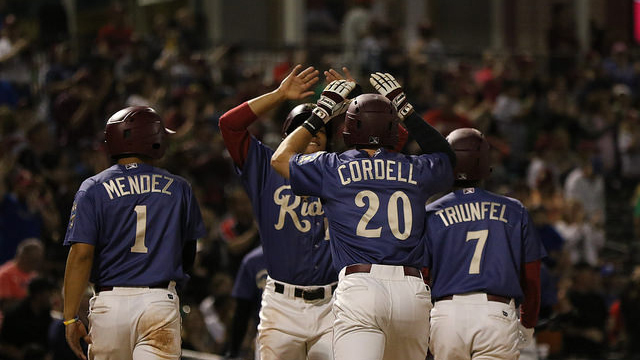 Cordell's grand slam came in the second inning to put the Riders (10-3) ahead 5-0, following an RBI single from Zach Cone in the first inning. Cordell is the only Minor League player to tally two grand slams so far in the 2016 season. The early offense helped chase Corpus Christi (8-5) starter Kyle Smith (0-2) after just two innings. Sadzeck (3-0) carried a no-hitter through 5 1/3 innings and picked up his third straight victory. The Hooks first hit came off the bat of Danry Vasquez. The only other hit Sadzeck surrendered was a two-run homer to Derek Fisher in the seventh before exiting the game later in the frame. He finished with 6 2/3 innings, two hits, two earned runs, one walk, and five strikeouts. Richelson Pena, Ryne Slack, and Adam Parks combined to hold the Hooks scoreless for the final 2 1/3 innings. The bullpen has allowed just five runs over the last 39 2/3 innings (1.13 ERA). The win snaps the Riders' two-game losing streak and puts them two games ahead of Corpus Christi in the Texas League South division standings. Frisco has won six of seven games on the road this season. Frisco and Corpus Christi will continue their four-game series Friday night at 7:05 p.m. The Riders will send RHP Sam Wolff (2-0, 1.64 ERA) to the mound against RHP Francis Martes (1-0, 2.70 ERA) for the Hooks. Live coverage can be heard on the Frisco RoughRiders Radio Network, on the TuneIn Radio App, and the MiLB First Pitch App. Dr Pepper Pregame Show begins at 6:30 p.m. The Riders next return home on Monday, April 25 to take on the San Antonio Missions in the beginning of an eight-game homestand, which includes Runner-Up Night on April 26. Tickets for all eight games are available now online at RidersBaseball.com, via email at info@ridersbaseball.com, over the phone at (972) 731-9200, or in-person at the RoughRiders box office. The Frisco RoughRiders are the Double-A affiliate of the Texas Rangers and play their games at beautiful Dr Pepper Ballpark in Frisco, Texas. The team was founded in 2003 and has finished first among all Double-A franchises in attendance in each of the last 11 seasons (2005-2015). In August 2014, the RoughRiders were purchased by an ownership group led by Chuck Greenberg and Scott Sonju. The new ownership group, together with the city of Frisco, has spearheaded numerous major franchise improvements over the past two seasons, investing over $7 million in wide array of facility upgrades and improvements, including the new state-of-the-art HD video board, sound system, Bull Moose Saloon, InTouch Grille, Riders Outpost Team Store, and the newest and biggest creation, the 174-foot Choctaw Lazy River. The improvements made prior to the 2015 season earned the Riders and the City of Frisco "Best Ballpark Renovation" of 2015 by Ballpark Digest. More than 130 former RoughRiders players have gone on to play Major League Baseball, including All-Stars Chris Davis, Elvis Andrus, Adrian Gonzalez, Ian Kinsler, Nelson Cruz, and C.J. Wilson as well as current Rangers stars Derek Holland, Rougned Odor, and Mitch Moreland. For more information on the Frisco RoughRiders and Dr Pepper Ballpark, please visit RidersBaseball.com or contact Nathan Barnett at (972) 334-1976 or via e-mail at Nathan@RidersBaseball.com.